From a commoner… to a princess!? You are living a peaceful life in the countryside when one day you meet a shogun and become a lady in waiting at his castle…! I have been screaming about this release (and another I have been waiting so long for! But more on that later!) since a source told me about its possible release, and I am excited! As a bit of confirmation, Voltage Inc. released its Meteor Shower Campaign in Star-Crossed Myth, which (shameless SCM plug) includes story sales for Leon, Scorpio, and the newly released Teorus, a special Scorpio story voiced by Junichi Suwabe, a Zodiac Tarot Card Reading, and… (drumroll)… a 12 Login Bonus with goodies from this upcoming game once you’ve reached 12 Logins! What are these goodies? You’re going to have to Login every day for 12 days to find out! I’m sure you won’t be disappointed! I’m told that the title of the English release will be Sakura Amidst Chaos. 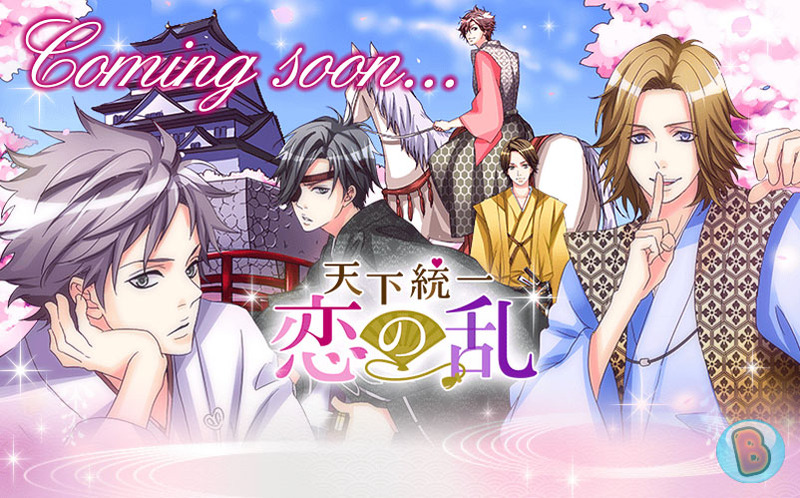 Nobunaga’s, Kenshin’s, Ieyasu’s, Yukimura’s, and Masamune’s Main Stories will be available upon release. This will be the first game released in English after the Invite-a-Friend Campaign has been officially retired, so we can at least expect those images to be released as part of future campaigns in or related to the game. I AM STILL SCREAMING! I have been waiting for this game since I started playing Voltage Inc. games back in 2012. I was extremely disappointed when My Wedding and 7 Rings was released in English before this one not only because I had been waiting for so long, but because this game was released for Android and iOS devices before MWa7R did. We know how skipping games works by now, Voltage! I honestly believed the English version of Tenka would never see the light of day! I’m still a bit bitter about it, but you know what? WE’RE STILL GETTING IT IN ENGLISH. I AM HAPPY! I know the game hasn’t been updated in Japan for months now, but I am fully expecting that all currently ported and released stories be released in English. I don’t care if that’s demanding! Now if you’ll excuse me, I’m going to go stare at my Tenka merch for the time being (and until a certain art university comes up)! It is set to be released in June. There hasn’t been any official announcement on the release yet, so keep your eyes open for any announcements or clues on Voltage Inc.’s Facebook page and make sure you take part in the Login Bonus to get those goodies!